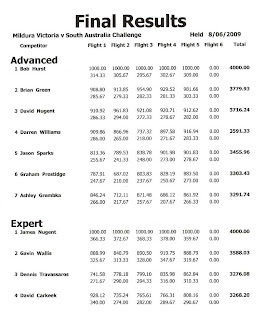 Some of Adelaide’s Pattern Pilots ventured up to Mildura on the 6th – 8th of June for the Annual South Australia versus Victoria Challenge. This is always a great weekend and one of the highlights of the year for us Pattern Flyers. 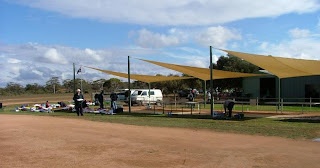 The site is great with awesome facilities these days thanks to a lot of hard work from the Sunraysia club members. The facilities would rank as good as anywhere in Australia I’d say. Jeremy and I travelled up on the Friday and got there in time to have a couple of flights, and catch up with a few of our old mates including Chris Swain our honorary South Australian who travelled from Canberra for the event. Conditions were superb with no wind and a fine sunny afternoon. We were assured by a couple of knowledgeable local full size pilots that this was all about to change, with the weather shaping up to be windy and wet ! Friday night we caught up at the local Tavern for dinner and a chat . . always an enjoyable part of the events. the occasional shower and nothing to really hold up the proceedings, although I think it rained fairly hard during the night. The quality of flying was generally very good, with many showing that they had been practicing. Young James Nugent was in fine form flying VERY well in Expert class and appeared to look very much in control of that class. He only needed one more promo point to be flying in F3A . . and he was out to get it ! ! 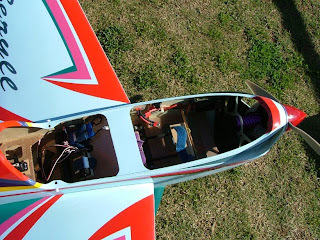 Sportsman pilot Wally Grembecki from Mildura was a notable improver, and looked to be flying in contention with young Robbie Simmons also flying well. In Advanced. Bob Hurst was looking the solid performer with Dave Nugent, Brian Green and Darren Williams keeping him honest. F3A had the usual TOP GUNS of GlennO, Marlo, Adam Crossman and Chris Swain (Aust F3A WC Team Member) . . should that be CrossO and SwainO ?? Those guys are REAL good, and their flying was looking the job. Neil Martin, myself, Fernando and Rob were trying very hard just to keep them in sight. The wind died right off at the end of the day . . so GlennO got his Sebart Pitts Python out for some 3D “Hucking” . . great performance too. That thing looks to fly SWEET. liking, and almost ate the paper napkins by the end of the night. Sunday dawned looking a little brighter on the weather front, with only a light shower early in the morning. The flying continued where it left off with all flying quite well. The apparent strong performers kept their form up throughout the day, with the long serving Sportsman pilot of Will Crossman starting to stamp what appeared to be some authority on the class . . although Wally was ‘giving it to him’ . .
tennis . . and young Chris Nugent taking requests for YouTube videos . . then James Nugent flying his Shock Flyer in the street under torchlight and managing to find the only letterbox in 100 Metres . . don’t worry James, the Shock Flyer wasn’t F3A legal anyway . . it was OVER 5kg ! Thank you to the Nugent’s . . it was all much appreciated by the SA boys ;o). 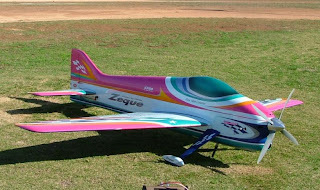 "LUNCHED" - remains of Jeff Boyd's 160 . .
make the flight line for my last flight. Thanks Jeremy . . awesome . . I really appreciate it. In the end Will Crossman (Vic) came out on top in Sportsman . . Bob Hurst (Vic) won Advanced . . James Nugent (Vic) BELTED Expert, and got his promo point (welcome to F3A) . . and GlennO (Vic) was awesome in F3A with a super performance. 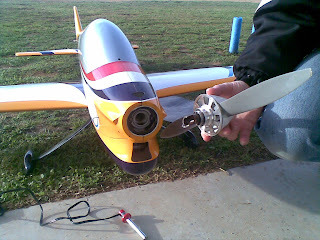 event was organized by picking a corresponding level pilot from a “hat” to fly against the South Ozzies. 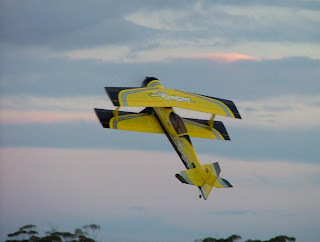 In F3A Masters, Marlo (Vic) flew against Neil Martin (SA) with Marlo just edging Neil out. 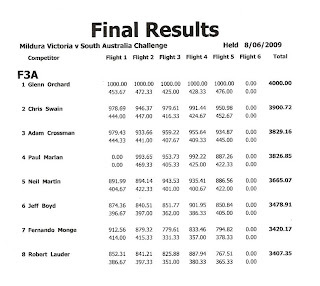 F3A had Fernando (Vic) flying against me (Jeff Boyd -SA) with me taking the victory for SA. 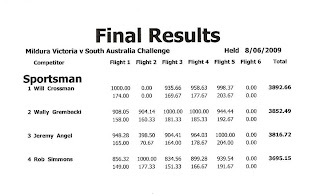 Sportsman had Will Crossman (Vic) flying against Jeremy Angel (SA) with Will taking the points . . so in the end, Victory to Victoria. NEXT TIME SA ! ! 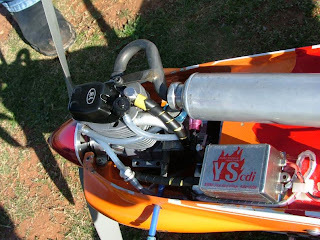 We must get more SA guys there for 2010 . . it’s a great event and an awesome weekend away. MARK IT DOWN FOR NEXT YEAR ! . . DON'T MISS IT !